I debated about beginning a series of wedding-related posts on The Short and the Sweet of It, but decided that the blog is a reflection of daily inspirations and a peek into our personal lives, and this is kind of a big deal, right? So from now on each Wednesday I'll blog about getting engaged and planning a wedding, and the rest of the week it'll be business as usual. 1. Champagne with two of my best friends, Kristine and Daniela. 2. A few wedding magazines with my Saturday coffee. 3. Ian pouring champagne into my parents' "engagement glasses" (which we'll have at our wedding). Notice the gorgeous flowers in the photo, a gift from my former roommates Katie and Savannah. DO IT - i'd love to read about it!!! 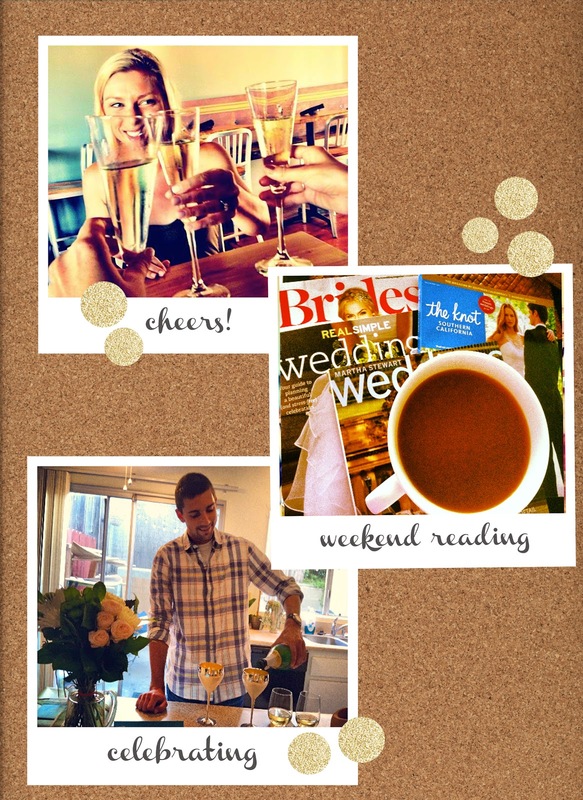 I love the little details that go into planning a wedding – glad you're going to share them! Love ya girlie and CONGRATS AGAIN! Cant wait for the updates! love this idea! Its always fun to get a sneak peak inside someones wedding plans.